The most fab-BOO-lous holiday is upon us, guys ‘n’ gals! In just a few short days, we’ll be celebrating the one-and-only Halloween! And you know what that means. It’s time to pin down the perfect costume for your haunted adventures, whether you’re trick-or-treating, passing out candy or partying it up! Not sure who or what you’re gonna dress up as come fright-night Friday? Not to worry! 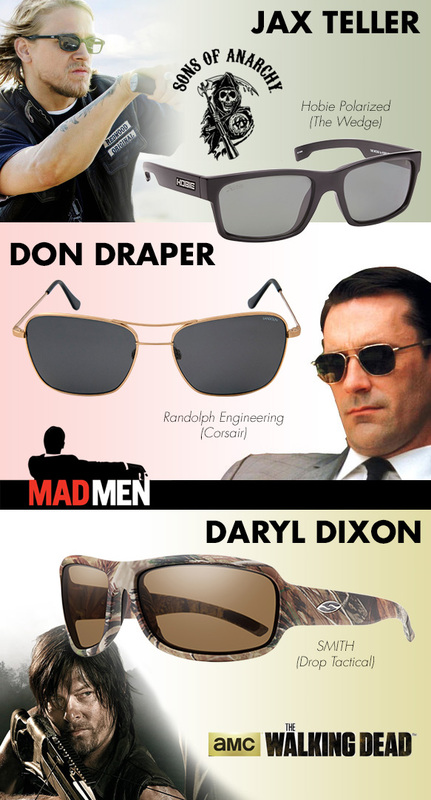 We’ve picked lots of guises inspired by our fave TV show and movie characters, and paired them with complementary eyewear, of course! So check ‘em out, and make your selection—you’re sure to look seriously spook-tacular in any of these get-ups! Powerful leading guys were our inspiration when it comes to these ensembles for men! Tap into your badass side by paying tribute to biker legend Jax Teller from “Sons of Anarchy.” All you’ll need to look the part is a leather vest, a few faux (or real tattoos) and a pair of lookalike black rectangular shades from Hobie Polarized. Wishing you were part of the retro era? Then rock garb similar to advertising extraordinaire Don Draper from “Mad Men.” Slip on an old-school suit and metallic gold square aviators from Randolph Engineering, and slick back those tresses, and you’ll look like you’re straight out of the 1960s. If fighting zombies tickles your fancy, then why not rock a Daryl Dixon from “The Walking Dead” costume? Sport worn clothes and camo-print sunnies from SMITH, slather yourself in anything that looks like mud and carry around a fake crossbow, and you’ll look ready to combat the unliving! Likewise, women should look to their coveted on-screen heroines when choosing a costume. The infamous Khaleesi , aka the Mother of Dragons, from “Game of Thrones” is a terrific choice. Snag an old-fashioned blue frock, wear a super long wavy blonde wig and flaunt sleek cat-eye specs with bejeweled embellishments from TURA to capture her essence. After all, what gal wouldn’t want to be a strong medieval queen? Take your hand at prisoner life by dressing up as convict Piper Chapman from “Orange is the New Black.” Pair bright orange glasses from Furla with your jail scrubs, and you’ll be the spexiest inmate ever. Last but not least, we can’t forget the epic Katniss Everdeen from “The Hunger Games: Catching Fire.” Transform into her doppelganger by donning a huntress outfit complete with her signature mocking jay pin and chunky wayfarer-inspired tortoise shades with fuchsia flash lenses from Gucci.